TEGUCIGALPA, Jan 18 2014 (IPS) - For some 250,000 shantytown-dwellers in the Honduran capital, fear of dying or losing their home due to a landslide or other weather-related event has been reduced, thanks to a global warming mitigation plan that has carried out small infrastructure works in 180 ecologically and socially vulnerable neighbourhoods. The 100×100 Plan – one hundred works in the same number of days – is part of a climate change risk mitigation project financed by the Central American Bank for Economic Integration (CABEI) with a 26-million-dollar credit granted on concessionary terms. The more than 100 small projects are scattered all over the city of Tegucigalpa, which is home to 1.8 million of Honduras’s 8.5 million people. Tegucigalpa and the adjacent city of Comayagüela – also known as the Central District – make up the capital of this impoverished Central American country. The city’s vulnerability increased when Hurricane Mitch left at least 11,000 dead and 8,000 missing in 1998, besides causing enormous damage to infrastructure. The capital, located in a chain of mountains that reach 1,300 metres in height, was among the most affected parts of the country. And 15 years after the catastrophe, there are still areas where time has stood still, and the ruins of houses are still standing. The 180 neighbourhoods selected for the project are home to the poorest of the poor, who live on hillsides where mudslides and landslides can occur after just one hour of heavy rain. One of the projects involved construction of a small bridge and the strengthening of the banks of the river in the Mololoa shantytown, on the northeast side of the city, where local residents are now able to get in and out of their neighbourhood and to evacuate in case of a storm. Mololoa, home to some 5,000 people, is an area at risk not only because of the vulnerability to landslides on the steep slopes, but also due to the high levels of insecurity and violent crime. Maras or youth gangs control the area, where there is a vacuum of formal authority. “We would even get fungus on our feet from walking down the hill in the water, because the vehicles that sell products didn’t come up, and when our kids got sick, we would carry them down the hill, sloshing through the water,” said Castellanos, 35, who is the head of her household. But now “even the vehicles that sell water come up without any problem, and the public transport does too, and we even have an evacuation route in case of disaster,” she happily explained, after describing the isolation the people of Mololoa used to live in. Johan Meza, in charge of mitigation projects in the 100×100 Plan, told IPS that the small infrastructure works include the construction of ditches, gutters, stairways, evacuation routes, pedestrian bridges, and storm water drains. The projects, he said, were determined by an assessment of the vulnerability of the city carried out by the Japan International Cooperation Agency (JICA), the United Nations Development Programme (UNDP) and other bodies. A few metres from one of the city’s main roads, in the east, is La Villanueva, full of crumbly, narrow steep paths that are an odyssey to climb. The mitigation projects here range from buffer strips and embankments to prevent landslides to storm water channels and ditches, the paving of streets, and staircases with handrails in areas where it used to be impossible to walk during the rainy season. La Villanueva is one of the most populous slums in Tegucigalpa, with 120,000 residents living in the area’s eight sectors. It is highly prone to landslides and the collapse of the homes that line the hillside. 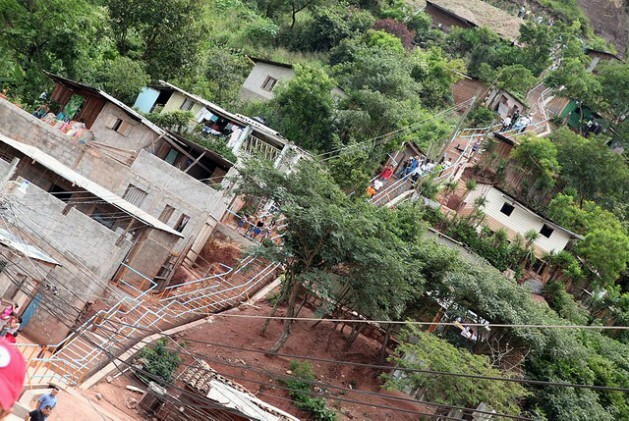 Pointing to the new stairways for which residents waited three decades, community leader María Elena Benítez told IPS: “We used to climb down the hill on all fours, to reach the bus; when it rained this was all mud, you can’t imagine how hard it was for us. “It was common to see people who had broken a limb, especially children or the elderly. But the authorities tell us that what they have done here is just a start, that La Villanueva will stop being a high-risk area and that now a training plan is coming so we’ll know how to take care of the mitigation works,” she said. “We know that this, even though it might not look like much, benefits everyone,” said Yovany Tróchez, president of the La Villanueva patronato – a local government institution that represents the members of the community – who accompanied IPS on the tour of the area. Álvarez and his team did not conceal their satisfaction with the mitigation works that they have organised, when they show the statistics indicating that the number of deaths from rainfall and landslides went down from 12 in 2010 to just one in 2013. The aim is for no one to die in weather-related incidents, Álvarez said. But until that is achieved, he said, the capital is already less vulnerable than it was 15 years ago, thanks too to the fact that local residents have learned to deal better with the risks. Álvarez stressed that Tegucigalpa is the Honduran city that has done the most to prepare itself for the risks posed by climate change. The next phase of the 100×100 Plan involves climate change adaptation, which includes an intense programme of training and provision of equipment in the areas that received assistance, so people are prepared and know how to use the evacuation routes in case of disaster. The fear of losing one’s home – or one’s life – has now diminished in shantytowns in Tegucigalpa like El Pastel, La Concordia, Campo Cielo, Flor del Campo, Brisas del Norte, Nueva Suyapa, Venezuela, Los Pinos and San Juan del Norte.